DENMARK: US giant GE has acquired blade manufacturer LM Wind Power for an enterprise value of €1.5 billion, after reaching a deal with LM's owner, private equity firm Doughty Hanson. GE said it intends to operate the blade manufacturer as a "standalone unit" under its renewable energy business. The US-based firm will "continue to fully support all industry customers with the aim of expanding these relationships", it said. LM Wind Power reported sales of €491 million and Ebitda of €87 million in the first half of 2016, which represented year-on-year growth of 40% and 81% respectively. GE said the takeover of LM, subject to regulatory approvals, should be completed in H1 2017 and will begin benefiting GE's earnings from 2018. Sydbank analyst Jacob Pedersen said the acquisition makes sense for GE as it improves its global reach and in-house capabilities. "It gives GE state-of-the-art knowledge of blade technology and creates a better foundation for global reach," Pedersen said. LM opened its 14th manufacturing site in July after work started at its second Turkish facility located in the west of the country. The company also has facilities in Denmark, Brazil, Canada, China, India, Spain, Poland and the US. GE currently has no blade production sites and sources most of its blades from LM. "Simply stated, we’ll be more local, have more flexibility and knowledge in turbine design and supply, and more ability to innovate and reduce product costs, while improving turbine performance," said GE Renewable Energy CEO Jerome Pecresse. LM CEO Marc de Jong said it was a "great day" for the company. "The offer from GE makes clear commercial sense for the growth of LM Wind Power and we are absolutely delighted with the prospects of having a world leader as our owner. "It provides us with the necessary stability, visibility and strength to continue to realise the ambitious growth plans of the business and fully utilise our advanced design and technology, improve our manufacturing capabilities and reliability, expand our global footprint and reduce the levelised cost of energy," he added. A spokesman for LM said both firms "very much" wanted to continue supporting industry players. LM has provided blades to most of the wind industry's biggest manufacturers. According to GE, one in every five of the world's wind turbines have LM blades. In September, LM provided Siemens with the 69-metre blades for the German manufacturer's new low-wind 3.15MW turbine with a 142-metre rotor, unveiled at the WindEnergy Hamburg exhibition. The hybrid-carbon blades were developed as part of joint project between the two companies. 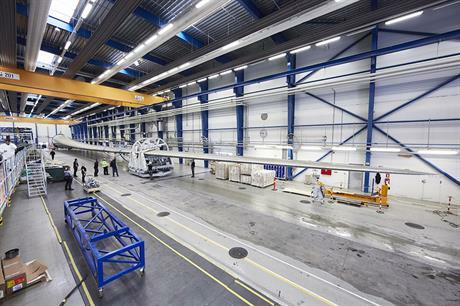 Previously, in June, the Danish firm unveiled the world's longest ever blade for Adwen's 8MW offshore turbine. The 88.4-metre blade was produced to provide the offshore machine with a 180-metre diameter rotor. LM is not the first blade company GE has acquired recently. In October 2015, GE confirmed it had acquired UK modular blade designer Blade Dynammics for an undisclosed fee. The move for LM Wind Power could help continue the growth of the modular design. LM Wind Power will sit under the GE Renewable Energy unit, which was formed following the acquisition of Alstom's power business in November 2015. The buy-out included the purchase of Alstom's 6MW Haliade offshore turbine, recently installed at the US's first offshore wind project, Block Island. LM provided the 73.5-metre blades for the five GE turbines installed off Rhode Island this summer. Sydbank's Pedersen suggested the acquisition of LM indicates GE's view on offshore wind has altered and the sector is becoming a viable industry, especially in the US. But he said GE was still short of a competitive turbine, something the purchase of LM will not help with.